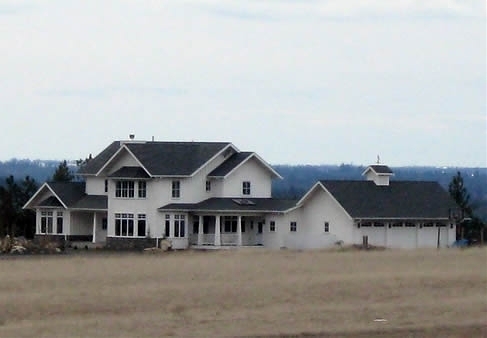 This two story farmhouse with a walk-out basement was built on 10 acres of rolling hills. The home features large wood windows placed strategically throughout to take advantage of the pristine 360˚ views. The ten foot ceilings on the main level highlight the detailed craftsmanship of the intricate crown molding, coffered ceilings and many built-ins. Special attention was placed on tying the trim work to the floor-to-ceiling cabinetry as seen in the kitchen. Along with the custom cabinetry, the open kitchen has a large island with a pie top, granite countertops and commercial grade appliances. The entry door was custom designed with arched top windows to complement the interior arches. The home also boasts a unique stair system which allows access from two sides, a centrally controlled integrated lighting system, in-floor heat in the master bath and a large custom tile shower with a frameless enclosure. The charming family room is accented by a wood burning fireplace with a gas log lighter. This home was designed by Nancy McKennon.